Last week I shared how Bing is offering ad-free, safe search for schools through Bing in the Classroom. But they are also literally giving away free tablets to non-profit organizations, and your kid’s school can qualify! Anyone can earn credits just by searching the web with Bing—similar to collecting box tops or earning miles in a frequent flyer program. Parents install the Bing browser and every time Bing is searched, credits are donated to your chosen school to be use towards Microsoft Surface tablets. Bing states that it take just 60 parents participates for a month to earn a tablet for your school. 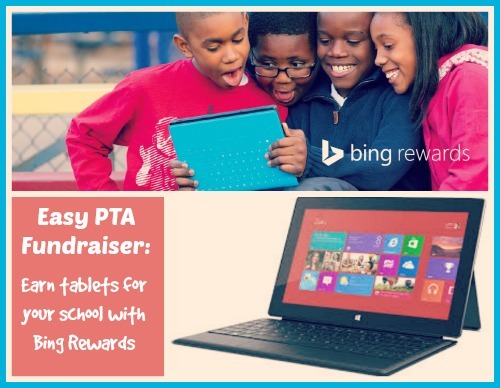 If you can get your entire PTA to change over to Bing and register for rewards, just think of the tablets you can earn in a school year! So far, Bing in the Classroom has served more than 35 million ad-free queries to 4.5 million students in more than 5,000 schools, and people have also donated more than 2 million Rewards credits to schools. There is no lengthy application process for your school, or for you. Simply sign up for Bing Rewards. All local schools have already been loaded to the Bing database, so designating your child’s school is a snap.